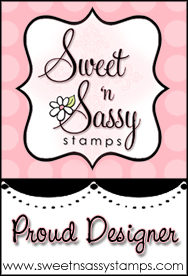 This morning I'm joining with the designers from Sweet'n Sassy Stamps in celebrating their Christmas in July new release! Korin has designed three new Christmas stamp sets celebrating the birth of our Savior. I have one card to share with each new stamp set this morning. For all the specifics of each new stamp set, please check out the SNSS blog. 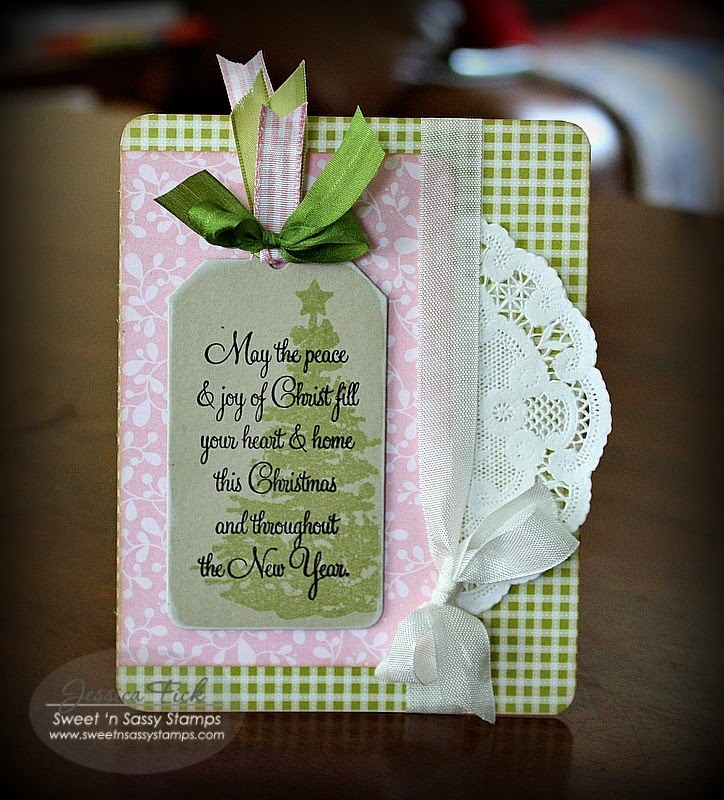 First up is the lovely Christmas Morn stamp set. I adore the silhouette tree image in this set quite a bit. After I stamped the tree and the sentiment, I used an impression plate for more interest - love that look, especially when it's enhanced a bit with soft ink. 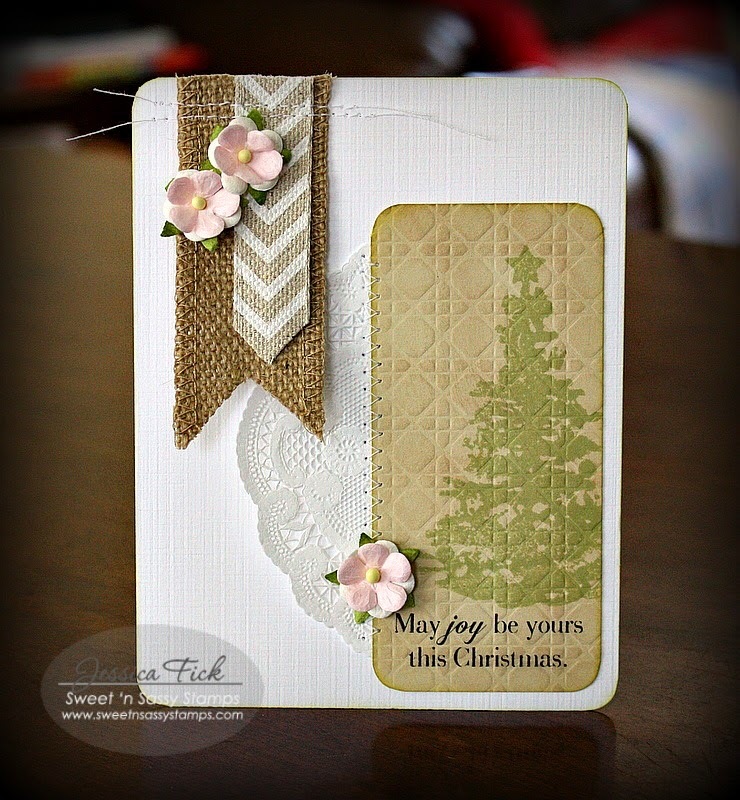 My second card uses the tree from Christmas Morn as well as the Christmas Innies stamp set. This time I went quite CAS, choosing only to embellish the tag with some white ink and fun ribbon treatment. I love this stamp set because of all beautiful sentiments included - perfect for the inside of your card or the outside! And, last but not least the new Jesus is Born stamp set. This set is chock full of lovely sentiments that all celebrate the birth of Jesus - such a great set for those of us who make Christmas cards. 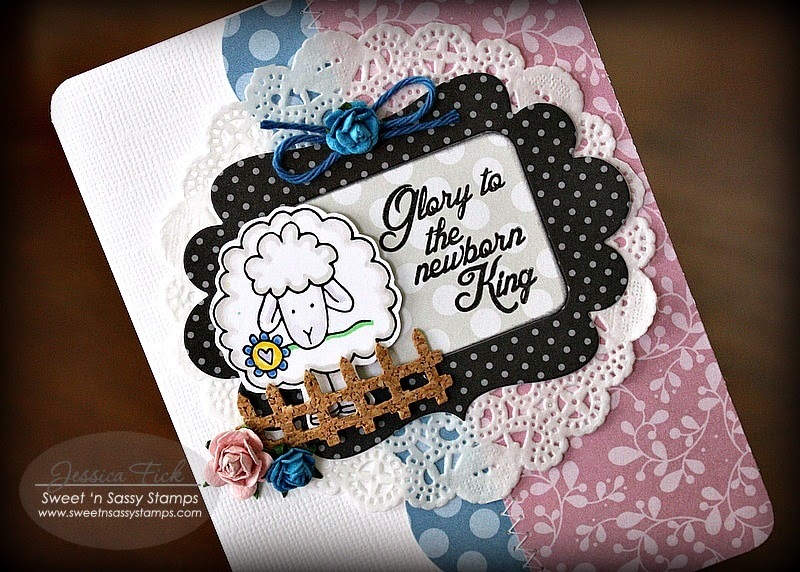 I choose to pair one of the sentiments with the sweet little lamb from Prim Blessings stamp set - remembering the shepherds who first received the glorious news of the birth of the Messiah. To see all the other designers' cards with today's new stamp sets please check out the photos linked below to be taken directly to their blogs with all the details. And, please remember to check out Sweet 'n Sassy Stamps' blog for all the details on today's hop and the challenge issued with it. All the specifics of each stamp set is also given there. All of your cards are beautiful! 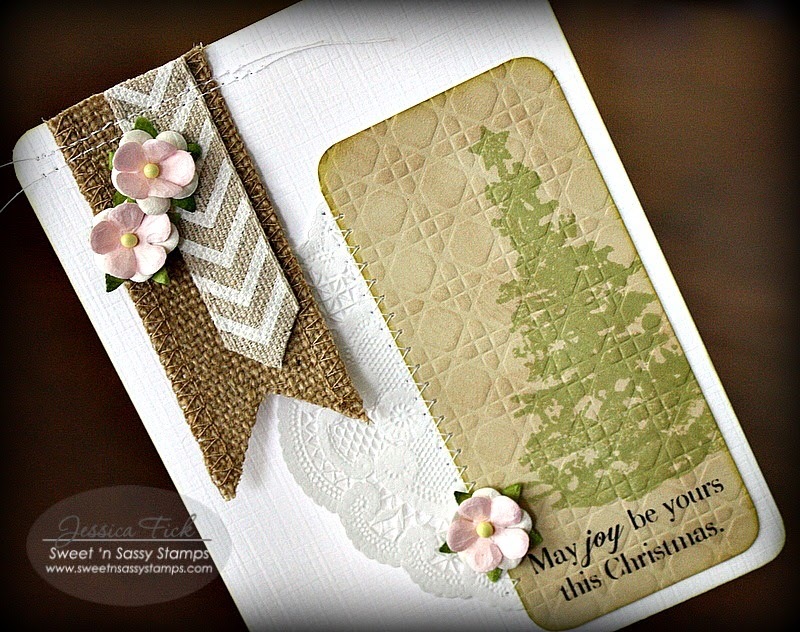 I like the look of you embossed tree panel in the first card...lovely burlap banners too! Fantastic cards! Each one is different and so beautiful! Such cute cards. Love the tag ribbon on your second card and the fence for the lamb on your third card. Beautiful cards. I like all the texture on the first, the doily and papers on the second and the use of the cute lamb on the third. Ooo . . . all of these are so beautiful! I really LOVE the first two; so elegant looking. And I love the addition of the pink on all of them. The layering on the cards is so pretty. Love the little lamb. He really fits in with the sentiment so well. thanks for sharing such pretty cards. Such pretty Christmas cards. Great use of texture and paper in your designs. Love the new release. Thanks for sharing. Beautiful cards Jessica. 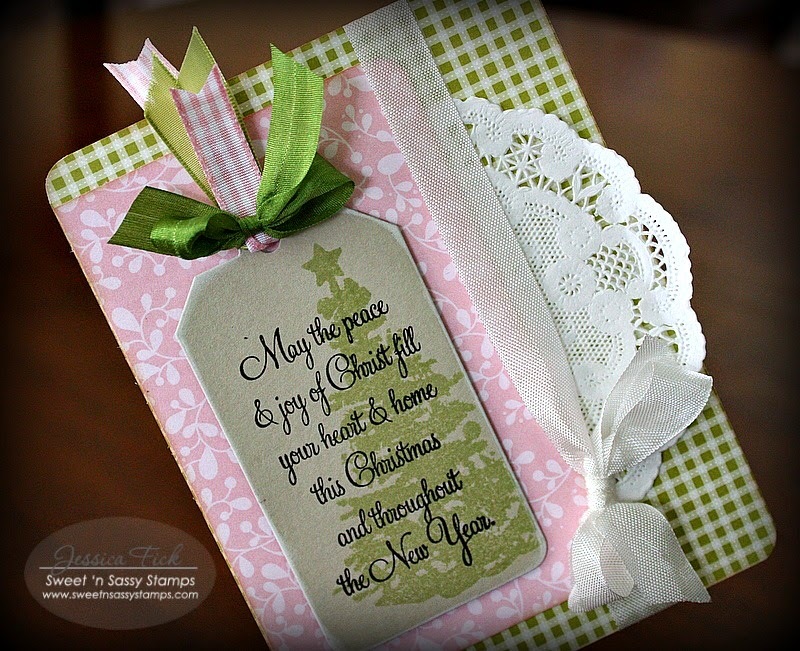 Love the trees on the tags, especially the first one with the dry embossing... what a perfect use of the sweet little lamb! Wonderful cards ... as usual. That sheep in your third card just makes me giggle! Love the soft CAS elegance in your other two, as well. Tfs!